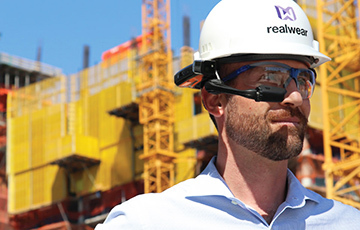 RealWear, Inc. today announced that State Grid, the world’s largest utility, selected RealWear as its supplier of hands-free computers for its line workers and electrical engineers to improve safety and productivity. State Grid said it chose RealWear HMT-1 over AR smart glasses or other headsets for its unique purpose-built, safety-conscious form factor, including a 100% hands-free user experience. State Grid completed a successful comprehensive pilot in Shanghai, one of the largest cities in China. The goal, with 200 RealWear HMT-1 computers deployed in the field, was to provide real-time remote assistance safely to workers for live-line maintenance without the use of workers’ hands. Hands-free computing is critical to workers as insulated gloves cannot operate touch screens and also will occupy hands required for the work. At a minimum, the work procedure is a three-person operation, requiring two workers in the bucket of the crane, the second worker holding tightly onto an insulated rope tied to the first worker working with his or her gloved hands, the third worker on the ground in a special insulated cabin watching the procedure on a mobile device, and even a fourth worker or more viewing remotely via laptop as though through the eyes of the first worker. The HMT-1 computer has a high-resolution video camera that the worker operates by voice, even in extremely loud environments due to its sophisticated noise-cancelling technology. RealWear, through a certified third-party testing agency, previously performed arc-flash testing of the HMT-1 to determine suitability for electrical generation, transmission, construction and maintenance industries. The agency tested the HMT-1 in its lab, following the ASTM F2621-12, the standard practice for determining response characteristics and design integrity of arc-rated finished products in an electric arc exposure. The testing system standard is used in more than 140 countries and involves exposing the HMT-1 to an open air arc at 8 kA, with a varied duration to attain a target energy exposure level (20-25 cal/cm²). That target level is a severe event that an electrical worker could be exposed to during routine work in the field.